Hood To Coast! A 200 mile, two day, relay run starting from Mt. Hood, and going all the way to the Oregon coast. I’d heard of it even before moving to Portland, and knew at some point that I wanted to do it, but with all the apartment hunting and exploring of the city, I didn’t realize the race was actually happening this week until, like, a week ago, by which time it seemed impossible to me that I could sign up. But, I was informed by certain running contacts that teams sometimes need runners at the last minute, and that the best thing I could do was leave my weekend open and tell everyone I knew I was interested, and to check online. Both the H2C forums associated with the race website, and the FaceBook page, had teams and runners posting info. The forums page didn’t seem to be working, but through sheer chance, I came across a guy named James on FB posting that his team needed a runner, yesterday, the day before the race! I put my name and number and lo and behold, he called, asking if I’d be interested. I of course said yes, and after quickly signing up through the website, I was in! With a group of complete strangers! The H2C website explains the race, and the rules, and there’s a recent documentary about the race, for those interested. The basics are that each team has twelve runners, who each run three ‘legs’ of varying lengths (four to seven miles) and difficulty (uphill, downhill, length, etc.). Each team submits their estimated pace times beforehand, and based on the overall team pace, is assigned a start time on Friday. I think the way it goes is that slower teams start earlier, so that, ideally, everyone finishes on the beach in Seaside at roughly around the same time, Saturday afternoonish. Each team has two vans. Our van number #1, with runners one through six, started at 12:15 at Mt. Hood, which is wonderful because, as runner #9, I don’t have to meet up with my fellow van members until 2:30 this Friday afternoon. Finally a race where I don’t have to get up at crazy-thirty! I get to the house of the Van #2 leader, Bud, a little early, but not too early, and am surprised to be the first one there. I thought he would be one of the runners, but it turns out a recent medical problem has bumped him out, though he will still drive. Instead, his wife Veronica is running his spot, though she’s run the H2C before as well. She doesn’t like running it anymore because she doesn’t like running at night, but is willing to help out, and as runner #12, not only does she get what’s called the ‘glory leg’ (finishing the race) but her night leg is actually only right after sunset. Gradually the other members arrive, and I find out that actually, none of them really knows each other either. Some are connected in some way to James, who isn’t here (he’s in charge of Van #1), but two, Jen and Christy, seem to just have been signed on somehow, which I hear is common. We hop in our huge van, donated from Bud’s workplace, and head to the town of Sandy, where we’ll make the exchange with Van #1. And this is why no one is in a big hurry. Runner #7, Christy, isn’t due to start until 5:30-ish, whenever our first six runners get through their first legs. I’m still just trying to learn all this, but most everybody has run H2C before. Christy has done it like three times, and Jen I think nine. Julie has done it a lot too, and usually runs her own team, but didn’t make the luck of the lottery draw this year. I think she’s related to James in some way too though. The other beginner is Donald, our youngest member, at 22, a marine reservist. He’s filling in for his boss, who is injured, and who knows James somehow. The Sandy Safeway parking lot is a madhouse, filled to capacity with team vans and SUVs, Since the first teams started at like 4:30 this morning, teams have been hanging out for hours already. We somehow find a parking lot and get out and...wait. This is what I wondered about, the waiting. But it’s also a time to get to know each other, and to zip into the store for last minute items, or just for food and drink. Also just to soak up the atmosphere. Many teams really get into this, with funny names, and themes, and costumes. Supposedly the names and van decorations aren’t supposed to be too risqué, so as not to offend the sensibilities of some of the more conservative small towns that we basically invade for two days, but there seem to be many that are pushing the boundaries, like for example the all women’s team van decorated with lingerie, or the team called the Human Centipede, based on that movie, and the South Park satire of it, with an actual picture of said human centipede on the side of the van. Van #1 arrives and I get to briefly meet the folks, including James, who is about the best guy to have as a leader in a large gathering of people, because he’s like seven feet tall, therefore easy to find. I didn’t think about it until now, but I’m not really going to see any of these people, except maybe at the few van trade offs. Which is weird, but ok. I ask Lucas, and another guy who’s name I don’t even remember, how their first legs went, and they both smile and shrug and say they went well. I think they’re both regular marathoners, and James has a Portland Marathon Pacer t-shirt, so this team actually seems pretty strong. Finally, the runner #6 from our team comes in, and hands off the team wristband to Christy, and she’s off! Now I finally feel like we’ve started, even though it’s been about five hours for Van #1. The good news is that they ran their whole section a half hour faster than predicted. So yay, even though, who knows, by tomorrow surely we’ll be dragging a little? Our group gets in the van. Van 1 can now afford to rest and take their time, while we must scoot to the next exchange area. Christy is only running about five miles, and by the time we get out of the parking lot chaos, and on the road, and then park in the new parking lot chaos, there’s actually not much time to stand around before she catches up to us and Julie take the wristband on. I’m next! I don’t even go out to see them hand off, wanting to just be ready to go when we get to the next station, so having my Vibram Five Fingers on and using a Honey Bucket for like the third time in an hour. At the next exchange station, I have a little time, but surprisingly not much. It’s about 6:30 in the evening. My section is almost seven miles, one of the longer legs, and will get on to the beginning of the Springwater Corridor, and huge long bike trail that cuts across most of the east Portland area. I’ve already ridden my bike on it way down in Sellwood, but up here it’s not even in Portland proper. And of course, as the one minimalist/barefoot runner, I get a section marked as my old enemy: Gravel. Thus the VFFs. One of the volunteers yells out our team number, Four Nine Nine!, and here comes Julie at a good clip! I’ve been pretty calm so far, but now I’m suddenly, strangely, nervous. I mean, it’s only seven miles. I run that almost daily. But, I get the wristband and take off. At this point I’m running on the side of a road, with traffic, no bike lane or anything. Weird that we don’t get lanes closed off for us, but thankfully most of the local traffic seems to be aware of us, and everyone is driving slowly. I’ve started off super fast, like at 5K pace, which is not sustainable. It’s the team dynamic—I don’t want to let down the team! Must. Run. Fast. To impress. People. I don’t. Know. But, I’m breathing way too heavy, way past aerobic level, so I take some deeps breaths, slow down, and relax a bit. I just can’t go all out for seven miles, though I’m still faster than marathon pace. More like half marathon pace, with the idea of speeding up as I get within two miles. Another oddness: I get to a traffic light, and it turns red. I’m used to being able to run through these things during races, but apparently not here. There is a volunteer across the street, smiling about me, and I give him a spread-arms gesture, like, Wtf dude? Can I go? But he just keeps smiling, and there are cars, so I stop. Another runner comes up behind me and asks me, ‘Do we have to stop?’ and she doesn’t, just goes right in front of some cars, passing me. After those cars have gone, and the road is clear, I scoot across against the light, past the still smiling volunteer. Later dude! And with a right turn, I’m suddenly on a gravel road, which turns into a two-track, which is the Springwater Corridor Trail. Oh, speaking of getting passed—there is apparently a term for passing someone during this race: roadkill. Some teams keep track of their roadkills and mark them off on the sides of their vans, though of course no one keeps track of how many times they’ve been passed themselves. As for me, I roadkill a couple guys, but have already been passed by a couple people. One guys labors up to me and says, ‘Wow, it took me an effort to catch up to you.’ I’m not clear why he’s telling me this, but then he asks about the VFFs, and seems shocked when I tell him I actually usually run barefoot. The trail turns to pavement, of the smooth bike trail variety, which I actually don’t like running on in VFFs. Something about losing the sensitivity in my feet feels like I striker harder, and my feet get sore. There’s a little unofficial dirt trail off to the side, which some shod runners are using, though it’s gravelly. Finally, I’m like, screw this, why am I not running barefoot? So I stop, getting roadkilled twice, and pull off the VFFs, carrying them both (a little awkwardly) in one hand, with my Amphipod bottle in the other. But aahhhh, the sweet feel of barefoot running! And I’m running faster now too! I even roadkill those who roadkilled me! And again, I reach a stoplight, where the path crosses a main road, and I have to stop and wait while the cars go, though one women remains stopped and waves me across. I wave a thank you and get going, because, looking at my watch, I can’t have far to go. There are no mile markers or anything, but I know I can run seven miles in under an hour. Time to finish strong! And then I hear cheering up ahead. The exchange station! Then a volunteer, who turns and yells our team number. And there’s Jen! She looks intense and ready to go! I hand off the wristband and she’s off! And quick to the van. She’s only running like four miles, so we have to scoot to get to the next station in time. And here I was concerned that we would be standing around a lot. Instead, we’re sitting in the van a lot. Ok, well, seems to make time go fast. Sun is getting low on the horizon. Weird that I’ll be running again, but not too soon. At like four in the morning or something! I didn’t realize how much Jen was creating a fun atmosphere until she’s not here. It’s quiet, none of the rest of us are real good conversationalists, whereas Jen has had a steady stream of funny commentary since we all met up with us. At first I was worried the Bud didn’t really like us, he hasn’t said much, but I think that’s just the way he is. He doesn’t even play the radio, nor has he had any coffee or any form of caffeine. But, that might be about the perfect person for a driver: super serious and focused on his job. I suspect he’s missing the running part, but I’m glad the driver knows where he’s going without too much help. That said, being both the driver and the timekeeper for the team is a little much, so Christy has stepped up to help out, including writing down our individual times, and doing some kind of math, adding them together somehow. There’s a whole official chart that needs to be filled out and handed in at the end of the race. I’m glad I didn’t get volunteered to do it. I would, without public complaint, but I get motion sickness really bad, and having to read times, and driving directions, would make it that much worse. At the next station, Julie hands off to Donald, who’s doing like I just did, and starting off super fast, super pumped. But, when we pick him up at the other end, he’s going just as fast. And then he hands off to Veronica, who will take the trail up through Sellwood (and past the Portland roller derby girls playing tonight! I am sad I’m missing that). We proceed into the city and park under Hawthorne Bridge, which is...very industrial. Along with all the cars going by over us, there’s some kind of construction going on, with big diesel graters moving dirt right next to the parking lot. I try opening my door to get some fresh air in, but it’s just too annoying. But, we all get out soon anyway, because the other van is here, to start their second leg. We all meet up and walk out to the river edge, where the runners are coming in. Cool to see the city at night across the river, and weird to have so many people gathered in this area, at night. In fact, the area is so crowded that I don’t even see the switch off. Suddenly there’s Veronica, looking tired and happy, and the Van 1 person is gone. I don’t even know who it is. We all amble back to the vans. Us Van 2ers are not in a hurry anymore. Now is our rest time, where we’re to proceed to some fairgrounds and supposedly sleep while the Van 1ers go into action. I’m tired. Everyone is tired, except, seemingly, Bud, who is just a driving machine. We get on I-5, then take the 30 highway west, which goes by all the industrial warehouses in north Portland, and the huge spider-looking machines that unload ships. Very post-apocalyptic in this area, though I’ll soon be moving into my new apartment, only a short ways away, in a nice quietish neighborhood near Forest Park, a huge, tree-filled park, with miles of running trails. But yeah, out here, industrial. And yet, here is the race course, again with runners running on the right side of the road, their backs to traffic, on the side of a highway. No way would I ever run on this road, at any time, and yet people are doing do, with all the regular Friday night traffic, plus the endless vans. It’s now ten-thirty, and I’m just amazed at the stream of runners. Never-ending! And speaking of traffic, we’re getting a little backed up. It seems there’s been a fire up in St. Helens, and in fact that route has been re-routed an extra mile and a half! That includes all traffic too. The cops have closed off the highway, so we’re all just crawling along, which is brutal, because it’s cutting into and sleep/rest time we’re going to get. We have to be up at 2:30! And the re-route route is a back road, with two way traffic, no shoulder, and runners. In the dark. Crazy. If traffic were actually moving fast, it would be dangerous, but no, we’re barely moving. Fortunately we have Christy with her iPhone, so she can find us a sneaky back way to the fairgrounds. When we first get to the fairgrounds, I see a huge open grassy area with a few tents and I think, whew, plenty of room to go find a dark quiet corner. But we go past that, and past some kind of other event going on, unrelated, and finally into a big parking lot. And more parking lot chaos. Not only do we have chaos, but people are sleeping (!) in their sleeping bags right in parking spots next to their van, so that when Bud is about to pull into one, he almost runs over some people! Wtf?! That’s fricking crazy! Oy. Wow, this is worse than any fire camp I ever slept in back in my firefighting days. I get out and explore. There are no official sleeping areas, not only that, the whole area is noisy. The runner exchange is on one side of the parking lot, with someone continuously yelling out team numbers through a PA. Next to the lot is some kind of high school event, or church, I’m not sure, but teenagers are doing kareoke (I can’t say singing exactly) up on a stage, also through a loud PA. Plus a generator going, and vans coming and going, with honks, and people yelling to each other. Zoiks. With a little exploring, I find a strip of pine trees along one side of the parking lot, under which is surprisingly a lot of clear area. And with soft pine needles to lay down on. I’m shocked that the whole area isn’t filled with sleepers, but there’s only a few. Well, if we really can’t go use that whole big empty grassy area only two hundred yards away, then this will have to do. I go back to the van and grab my bag o’ stuff, making sure to tell Julie and Bud where I’ll be. Everyone seems surprised that I’ve actually found a spot, and only Donald and Jen decide to join me. We find a flat spot, behind the trees, right up against a chainlink fence and spread out our sleeping bags. We have about three hours. We have to get up at 2:30 to be ready to go at three. And though the pine needles are soft, we are only ten feet from where cars are parking, so that sometimes headlights are shining right on us. Kareoke is going strong—some girl is singing “I Love Rock and Roll” and there’s just noise: People coming and going, talking right by us, yelling at each other. Jesus, do they not realize that some people are trying to sleep? And my favorite: a car alarm goes off, and no one seems to be near to turn it off. Sweet. Yeah, I’m not sure I’m going to sleep. I set my watch alarm, hopefully correctly. Jen and Donald are relying on me to wake them up. Great. Still, despite the continuous noise, I kinda sorta manage to drift off every once in a while, and for a blessed amount of time, there’s even a moment of relative calm. Still, I’m getting continuously woken. But at least I’m able to stretch out and at least relax my body. I’m way more sore than seven miles should make me. It’s not the running, it’s the running then sitting in a van for hours. Finally I’m just kind of up, and look over at our van, and see Julie (or Katherine? Argh, I’m getting names mixed up) getting ready. It’s only two o’clock, so I quietly get up and go over and ask her what’s going on, only to find that Christy is already out at the exchange area, ready to run. Wow, we’re early. So I go back over and gently wake up Donald and Jen, both of whom seem to have slept better than I. Jen sits up straight, dazed-looking, not even knowing where she’s at. We gather our stuff and head over to the fan. Jen says that’s the first time she’s ever actually slept during a H2C. And somehow Bud is ready to go. I have no idea if he even slept at all, but he just looks calm and focuses still. A machine! I don’t even see the other van this time. We gotta get going. Christy will be done in less than an hour. And traffic continues to be slow, and even backed up. The problem (or, one problem) seems to be that some of the parking areas at the exchanges are on the opposite side of the road, so that vans have to cut across the running line to get in. So if there’s runners coming, we have to wait, while more vans pile up behind. Not only that, but the parking areas are small and crowded, with varying degrees of volunteer competence in getting people in and out (though for the record, all the volunteers rock for doing this, especially those who drew this late night lot). But the backed up traffic becomes such a problem that runners and time keepers have to get out of the vans and run up to the exchange areas. Sometimes people running the leg run by with the person they’re supposed to exchange with! It’s madness. And yet, getting out of the van early is apparently against the rules, with a penalty of a half hour added to total team time. Which is crazy, because what else is a team supposed to do? It’s not like we’re dicking around getting a pizza or something between stations. At exchange 21, Bud tells me to hop out and proceed up. Fortunately I’m ready to go. So I say good bye to everyone and Christy and I head up. Julie comes in, and I’m off. Again, this section is gravel road. All gravel. So I’ve got the VFFs on, but I think I should’ve at least brought my Merrell Trail Gloves. This is going to be brutal on my feet, because I can’t even see where my feet are landing. I don’t have a headlamp, just carrying a flashlight, but even then, with all the vans going by, there’s a huge dust cloud. So, I’m basically running blind. The only advantage to the vans is that their headlights let me see a little. Despite all that, I still feel the urgency of running fast and not letting down my team. This leg’s only five miles, there’s no way I’m going to take more than an hour. But man, sometimes I’m just slamming down on rocks. Trying to run light and quick, but it’s fricking four-thirty in the morning. At one moment, one glorious moment, no vans are around, and no other runners nearby, and I am alone, with the stars huge and bright above me. Up ahead, the small red and white lights of runners, though they seem like fireflies, or fairies, or elves. Magic. Then another convoy of vans comes through, and a couple super fast runners roadkill me easily. Grr. Really, for this section, a barefoot runner needs the right tool, and the right tool is something with a thick, perhaps cushiony, sole. Hate to say it, but true. Although, that said, throughout the day I have seen a fair amount of VFFs, plus some folks in zero-drop shoes, and at least one person in huaraches. So, there are others out there. Although I was groggy before, once I’ve been running, I warm up, and wake up. In fact, I’m in total mindfulness mode, trying to get all my focus on the feet, avoiding pokes as best I can. And then, lights ahead, and the yelling of numbers. A volunteer asks my number, I yell it to her, and she yells it to someone else, and there is Jen, ready to go again. Good to see her. I hand off and she’s gone. Christy is the only one here, everyone else is back at the van, catching cat naps. We hop in quick and get on the road, because Jen doesn’t have far to go, and it’s mostly all downhill too. But again, traffic is just slow and backed up. Bud is getting frustrated. Everyone is. The veterans say that this is the worst the traffic has ever been. It certainly makes things less fun, being trapped in the van all the time. We, and other teams, just have our runners hop out of the van and run up the road to the exchange areas. At this point, the runners are all moving faster than the vans. People in back are dozing off, but since I’m sitting in the front passenger seat, I kinda feel obligated to stay awake and help Bud stay awake, though I’m too groggy to come up with any kind of small talk, really. And I’m not sure Bud even needs or wants that. In fact, that might even annoy him. But I at least want another set of eyes awake. But man am I tired. I’m glad that last year I ran the Burning River hundred mile ultra—there are a lot of similarities. I think that race helped me with the mental stuff for this race, and I can also see how this race would help someone prepare for an ultra. Just shows how races in general help make us better, stronger, runners. Even for example, a marathon. If someone can get through Hood To Coast, I think they’ll have enough physical and mental strength to get through one. After finally rotating through our Van runners, we head to the next van exchange area, but again, by the time we actually get there and parked, we only have at most two hours before our first runner has to go again. But we take advantage of it. Bud and Veronica go to the sleeping area. Others get in line for the Honey Buckets, which is so long, it might possibly take two hours to get through. Me? I’m getting breakfast. I need real food, not another Clif Bar. There’s a place here, not even a restaurant, seems like a family kinda selling stuff out of their garage, where one can get french toast and muffins and chips and stuff. I’m totally down for french toast at this point. If fear getting sick later, but my body seems to say it’s ok now. I go minimal on the Mrs. Butterworth though. I even break my vegetarian diet and consume some bacon. Just sounds fricking good right now. After another Honey Bucket stop, at a different parking lot, with a little less people, when I arrive back at the van, Christy is the only one there, and she’s worried. The other van is here, and their runner is coming in early, and no one else is around. Plus she’s only running like four miles, so we need to really scoot to make the next exchange. She goes off to be ready to run. Donald finally shows up and agrees to stay at the van while I go try to find people, but the only one I find is Julie. The exchange is made. James finds our van, be we haven’t found anyone else. We’ve texted Bud, but I bet he’s off sleeping somewhere. James finally makes a round and finds them, and the others drift in. So, later, we pull out and try and get to the next station, though again, we have no time to even park, our next runner just gets out of the van and goes. The sun is out, and heating things up. My third leg is another seven miles, this time on pavement, but so far the roads have been fairly shady. So, I’m thinking barefoot. My only worry is that the pavement will get too hot and I’ll get blisters. But I think it’ll be ok. Still, I start off with VFFs. Not sure why, since after about 100 meters, I’m like, grarrr! get me out of these things! And it’s fine, wonderful even. Shady, plus the pavement is new, and there’s a brand new white line along the side which will keep things even cooler. Some hills. I end up going back and forth with this woman. She roadkills me on the uphills, then I catch her on the downhills. Things are going so great that when the van drives by and Bud yells out, ‘Want us to take your shoes?’ I’m like, yes, let’s do it. But a quarter mile after they leave, the pavement suddenly turns very rough and point. Argh! No! I mean, like painful. My speed suffers, and that woman roadkills me for the final time. I’m still running, even fairly quick, but not like before, and I’m not sure I can take another five miles of this. Damn. Damn damn damn. Plus the road gets less shady, and therefore more hot. Plus more little pebble grit things. Argh. I’m getting roadkilled now. But then, a miracle: the pavement turns smooth again! Yes! I just pour on the power, following that cool white line! I will not be passed anymore. This is it, my last leg, and I’m full of energy. Time to leave it all out on the course. Roadkill time! By the time I see the exchange area, I’m almost sprinting. My feet may regret it later, but that’s ok.
After Jen heads off, I wobble-follow Veronica through the crowd. People are just now seeing my feet and gasping. Ok, I feel good that I’ve done some representin’! Veronica is amazed. She’s apparently not even heard of barefoot running before this. I’m done. Now I just have to wait it out, while we do the last few exchanges. Now that the Van 1s are all done, and headed to Seaside, the route is much much clearer. In fact, those bastards in Van are now at the beach, swimming, while we’re still running! Donald’s last leg is seven miles, and he comes in dripping sweat and kinda of pale looking. I’m a little worried, but he doesn’t faint or anything. Veronica heads off, and so do we. Next stop, the coast! We park in Seaside, and walk six blocks through town to the huge tent city out on the sand, where the runners are coming in. But by the time we get there, and find James and crew, Veronica is already there! And, though she’s really already officially finished, time-wise, there’s this weird process where we all get into a chute, wait for our name and number to be called, then trot out in the sand to run the celebratory hundred feet to the celebratory finish line. Kinda of anti-climatic. I thought we would actually wait for her out on the course and run in with her for the last quarter mile maybe. But oh well. We’re done! We collect our medals! Does feel good to have us all gathered together, though some of the Van 1ers are already in bathing suits and seem already mentally ready to go. I too am ready to go. My sister and her family have come out and are waiting for me down the beach. But, we go through another chute, get an official group photo taken, and then gather at a table in the food court while James groggily tries to figure out all the times, and add them together and compare it to the stopwatch time. I’m not sure what exactly that entails, but he apparently has to turn in our time. Turns out we finished an hour earlier than anticipated! I guess that has to do with all the substitutions, but that’s ok. In fact, weirdly, we’ve done so well that we’ve pushed ourselves out of the time, a half hour on either side of the predicted time, in which the group earns a guaranteed place for next years race! I don’t understand that quite, but ok. The big question, which Donald and I have been asking each other, is, Will we do it again next year? And at this point, I don’t know. Has this been fun? I think so, though the traffic was awful, and I didn’t like spending most of my time in the van. But, I don’t know, the whole experience has been fascinating, and challenging. The mental aspect more than the physical. I think to, although overall this group has been great, that to do the race with a group of people you actually know would be even funner, as would getting more into the fun and humor and having a funny group name and theme. Not sure. Not saying I want to wear a red dress the whole time, but some groups just seemed to be having an awesome time. I think though, once I’ve recovered, it’ll be like a marathon, and I’ll think, Hell, yeah, I gotta do that again! PS-We finished 31/360 teams in our division and 177/1068 overall! If you can bear it, here's another article by a so called expert doctor who claims to have done research on barefoot running, without, apparently, checking any of his info with, say, a barefoot runner. 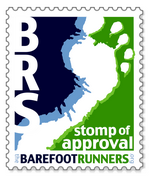 If he'd bothered, he would have been informed that barefoot runners do NOT land on the forefoot. We come down flat on the whole foot, using our arches for what they were evolved for. Coming up: A review of my "Prepare To Die!" 20 mile run/meetup with BF runners from Oregon and Washington!